Luckily CO2 has no significant warming effect outside the laboratory else ecowarriors start cutting the rain-forests down to save humanity. Recntly, NASA released data from the OCO satellite borne instument measuring CO2 emissions across the globe. 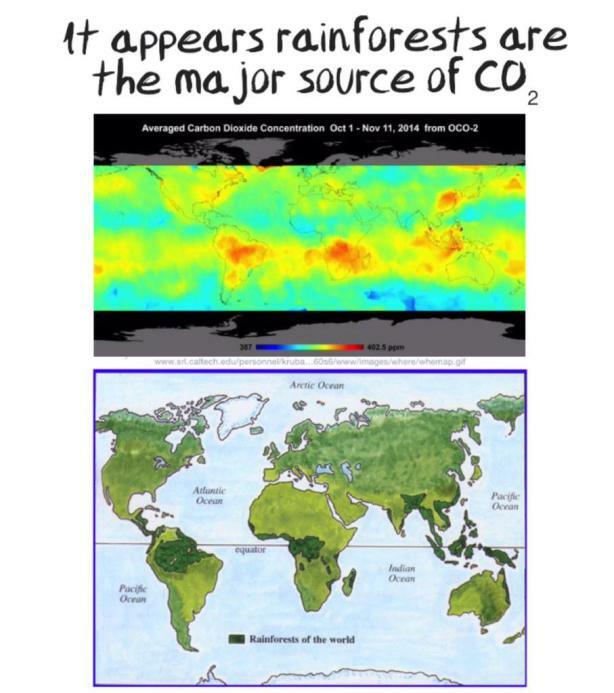 The December data with a map of the Earth’s rainforests in the image below clearly shows where most CO2 is being emitted. But looking at NASA’s ‘Earth Now’ page for CO2, you wouldn’t recognise the true situation. Cape Town – The “use it or lose it” principle will be applied firmly to redistribute farmland to ensure South Africa’s agricultural output does not decline further, minister of land reform and rural development, Gugile Nkwinti, said on Tuesday. “You know, use it or lose it will work now, with the recapitalisation and development with the strategic partnerships we will form with farmers whether active or retired,” he told a media briefing in Cape Town. “Our view is that [we should] give them a chance, establish a clear system of managing these farms, provide necessary support and those who do not want to work the land, take them out. Nkwinti pointed out that the principle would not apply to people who were given land as part of the reconstitution process. On Tuesday, Nkiwinti put the figure considerably higher and painted an increasingly bleak picture of the overall state of land reform. He said it was untenable that more than 90% of the 5.9 million hectares of land the state bought for emerging farmers was not productive and that the state was therefore losing revenue. “So we cannot afford to go on like that. We then say the agriculture sector’s production as a proportion of the GDP is going down, this is part of the reason. That land has been given to people and they are not using it. No country can afford that. Nkwinti said the state spent billions buying going concerns in the “hope that these things will continue to produce but this has not happened”. He said 15 years after the post-apartheid state introduced land reform, it was “not close to completing the process except in the Western Cape”. He reiterated that government would not meet its target of turning over 30% of arable land to the black majority by 2014 as the state simply does not have the R72bn needed to achieve this. He said this informed the decision last year to adjust the ministry’s budget to allocate 25% for recapitalisation – which will see some R254m flow towards 200 farms in distress. The minister said this would cost the state an estimated R207m in guarantees. Nkwinti said his ministry’s green paper on land reform was running late partly because officials were still working out how to structure strategic partnerships that will support the recapitalisation and development of emerging farm enterprises. It is now scheduled to be published at the end of May. Guess what, it still never happened ofcourse. They are stuck in the bizarre worldview that current large farms just runs themselves and need not be worked. As in other failed african ex-colonies just taking away land from large landowners and redistribute it only resulted in land laying waste and equipment rusting away. Big landowners are now being threatened by expulsion from their land, hugely popular amongst the large population because those targeted aren’t black. And were they aren’t threatened they are murdered by raiding parties. Which only results in more land going to waste since it only be worked for selfsustainment farming. The end of the downwards spiral isn’t in sight, South Africa will just go the same way as Mozambique and the like as soon as the last farm has been destroyed. So is this a cultural thing? One cannot help but wonder. For starters, there is evidence suggesting that paying attention to your happiness, a crucial part of well-being, can actually make you less happy. In one study, two groups watched a video that usually makes people happy – a figure skater winning a prize. Afterwards, participants filled in a questionnaire to assess happiness. The only difference was that before viewing the video, one group read a statement emphasising the importance of happiness and the other group did not. Those who did not read the statement were more happy after the video. Consciously focusing on our happiness can backfire. An obsessive focus on wellness can also make us more judgmental, potentially worsening societal divisions. Those who highly value well-being tend to view those who don’t come up to their high standards as “disgusting”, even if the truth is they can’t afford a personal yoga instructor or the latest lifelogging technology. A fascinating stream of research in moral psychology has found that when feelings of disgust are triggered, we tend to rapidly make highly punitive moral judgements. For example, we are more likely to harshly judge people who “turn our stomach” and we ascribe morally unattractive traits to them, such as being lazy and untrustworthy. While workplace programmes promise great things, they sometimes deliver disappointing results. For instance, some studies have found wellness initiatives only helped a small number of employees lose on average half a kilogram over a year. While any weight loss is not to be sniffed at, it is uncertain whether such modest results are worth the billions spent achieving them. A significant number of children with alleged vaccine injury had pre-existing neurologic or neurodevelopmental abnormalities. Among those developing chronic epilepsy, many had clinical features suggesting genetically determined epilepsy. Future studies that include genotyping may allow more specific therapy and prognostication, and enhance public confidence in vaccination. The murders today in Paris are not a result of France’s failure to assimilate two generations of Muslim immigrants from its former colonies. They’re not about French military action against the Islamic State in the Middle East, or the American invasion of Iraq before that. They’re not part of some general wave of nihilistic violence in the economically depressed, socially atomized, morally hollow West–the Paris version of Newtown or Oslo. Least of all should they be “understood” as reactions to disrespect for religion on the part of irresponsible cartoonists. Because the ideology is the product of a major world religion, a lot of painstaking pretzel logic goes into trying to explain what the violence does, or doesn’t, have to do with Islam. Some well-meaning people tiptoe around the Islamic connection, claiming that the carnage has nothing to do with faith, or that Islam is a religion of peace, or that, at most, the violence represents a “distortion” of a great religion…. A religion is not just a set of texts but the living beliefs and practices of its adherents. Islam today includes a substantial minority of believers who countenance, if they don’t actually carry out, a degree of violence in the application of their convictions that is currently unique.